Toller, a devout small-time priest played sensationally by Ethan Hawke, is loyal to his congregation; even if he is aware that his first reformed church now belongs in a separate league when compared to a nearby modernized megachurch managed by Pastor Jeffers (Cedric the Entertainer, in a proficient role that caters to his charisma). Toller treats his influential role with pride, and his patrons with respect. He encounters some hiccups with the latter, however, when a young parishioner (Amanda Seyfried) requests his private service for her deeply disturbed husband Michael (Philip Ettinger). Going into the confrontation with intentions to talk matters out, Toller becomes intrigued with Michael’s existential crisis, and falls further down the rabbit hole of existence when he overwhelms himself with Michael’s theories. Movie goers observe Toller sinking deeper and deeper in discouragement as he evaluates his life, and the eternity of everything. Early on, First Reformed appears to be cynical with its damp perspective along with lingering, well-composed shots of emptiness. Schrader, however, turns the film around while also staying true to Toller’s concerns. Paul Schrader, with his relentless and methodical storytelling, portrays the importance of hope in dire times, and how particular actions can have long-lasting effects no matter how insignificant they may seem. The film performs on a small stage with a limited cast, but it addresses big questions with fortitude. 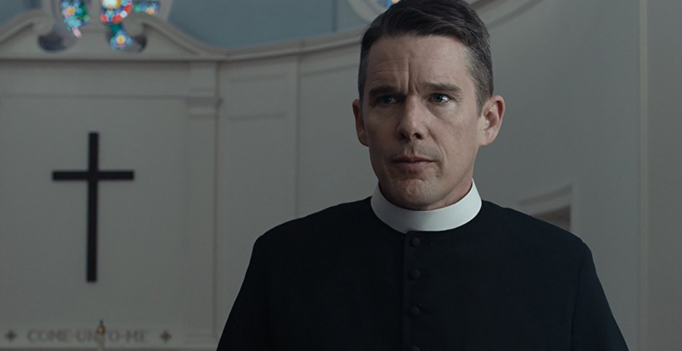 First Reformed will wear you down, but it’ll also stick with you.